Project ”MenCare – engaging men in achieving gender equality in Međimurje County” is being carried as part of global and regional fatherhood campain aiming for men to be allies in supporting women’s social and economic equality and building non violent society. Project ”MenCare- MenCare – engaging men in achieving gender equality in Međimurje County” is being carried as part of global and regional fatherhood campain aiming for men to be allies in supporting women’s social and economic equality and building non violent society. Međimurje county will be involved together with more than 30 countries on five continents in campaign that promotes men’s involvement as equitable, nonviolent fathers and caregivers in order to achieve family well-being, gender equality, and better health for mothers, fathers, and children. Campaign will inform the community, and through project the gender transformative manual P will be translated and adapted and workshops will be held to build capacities of health and social workers. Status M will deliver capacity building seminar for professionals working with young and future fathers – health, social and youth workers. The seminar will empower professionals to use the methodolodgy of Manual P in their direct daily work with beneficiaries. After the seminar, professionals will run series of workhops with young and future fathers by P Manual. In the final stage, a research of experience will be carried out, while the project results will be presented in the wider community. 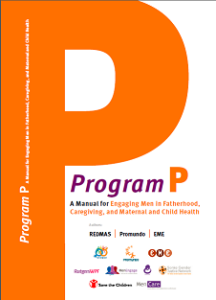 The Manual is formed of three parts: Fatherhood in health sector – A guide for health professionals on engaging men (dealing with prenatal care to care till age 0 to 4); Group activities for fathers and their partners (dealing with division of caregiving, non violence, needs and rights of children) and Mobilizing community (a campaign guide). Program P was developed as part of global MenCare campaign, run by organization Promundo and is being used through organizations members of MenEngage network.